The University of North Florida Student Union in Jacksonville, FL was voted as the No. 1 project in Florida by architects and No. 4 in the popular vote. The AIA Florida Chapter launched a Top 100 Buildings online competition four weeks ago and received 2.4 million votes. Gate Precast Company produced the sustainable architectural precast concrete exterior wall system for UNF's Student Union building. The energy efficient precast concrete wall system incorporates both thin brick and insulation. Gate Precast is honored to have three additional structures listed in Florida's Top 100 Structures. 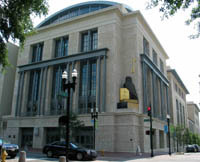 This 300,000 sf monumental building is the first project of this size to showcase a rusticated Gatestone architectural precast concrete finish to achieve the architect’s desire to simulate classic coquina stone. It is not uncommon to see pedestrians reach out and touch the exterior to feel the texture. Features over 470,000 sf of architectural precast concrete using native aggregates - natural Florida Limestone and coquina shell from St. Augustine. The project features a striated pattern that changes direction as the sun moves around the building. Gate Precast completed the Marcene H. and Robert E. Christoverson Humanities Building, one of the buildings on FSC's campus. The use of precast panels on this project was to complement, but not mimic the use of horizontal CMU blocks thru Frank Lloyd Wright’s campus work, while creating its own unique modern horizontal grid language within the panel design. Built in 2005 by Leers Weinzapfel Associates in association with Heery Design. The building's design includes a 140-ft-tall entrance tower clad with blast-resistant architectural precast concrete panels. 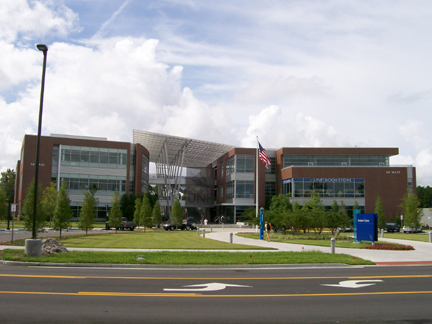 The building also conforms to wind criteria due to its location in a hurricane prone environment. Check out the other buildings selected as Florida's Top 100 structures. Florida AIA is celebrating its 100-year anniversary. The online competition was an excellent means to highlight the accomplishments of the talented architects who have shaped the skylines of Florida.